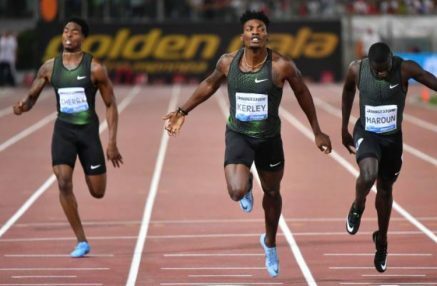 3rd June 2018 – At the latest IAAF Diamond League event in Rome, Fred Kerley (USA) earned his first 400m victory. After his first race in Shanghai Fred felt that he let the field steal a march on him at the start and it was apparent he wasn’t going to make that mistake again. Asserting himself early on he clearly led coming into the final 100m and although pressure did come over the final strides, particularly in the form of Abdalleleh Haroun, Fred stayed strong and took the win in a season’s best of 44.33 seconds. Matthew Hudson-Smith (GBR) was seventh in 45.52 seconds. Fred then showed an even faster turn of foot as he next lined up in Hengelo two days later. This time he stepped down to the 200m and again produced a strong performance taking third place in 20.43 seconds. There was also a great run from Andrew Osagie (GBR) who took fourth place in the 800m running 1:45.09, his fastest time for five years and also a current European lead. At the Cayman Invitational Jenna Prandini (USA) took the scalp of former Olympic Champion Shelly-Ann Fraser-Pryce as she convincingly won the 100m in 11.16 seconds. Schillonie Calvert-Powell (JAM) was fifth in the same race having earlier taken fourth in the 200m. Ristananna Tracey (JAM) ran a season’s best of 55.38 seconds as she finished second in the women’s 400m hurdles.